Should you ever need it, you have access to 24-hour emergency roadside assistance for five full years (3 years/36,000 miles for Mitsubishi i-MiEV), regardless of mileage. * Covered services include towing (even in the event of an accident, as allowed under law, where there is no police report filed due to additional property damage or personal injury), jump starts, flat-tire service, emergency fuel and fluid delivery and much more. Call 1-888-MITSU2015 (1-888-648-7820) for service information. When you purchase a new Mitsubishi, we'll mail you a wallet card with important details. On this card, you will find your vehicle identification information, our Roadside Assistance 24/7 toll-free number and directions on how to get help fast. You should always keep one of these cards handy (in a purse or wallet) in case of a roadside emergency. Your Roadside Assistance Program covers your Mitsubishi, you and all other family members who may drive or be a passenger in your Mitsubishi vehicle for five years and unlimited miles. Getting emergency Roadside Assistance has never been easier PLUS access discounts and earn a Mitsubishi reward. 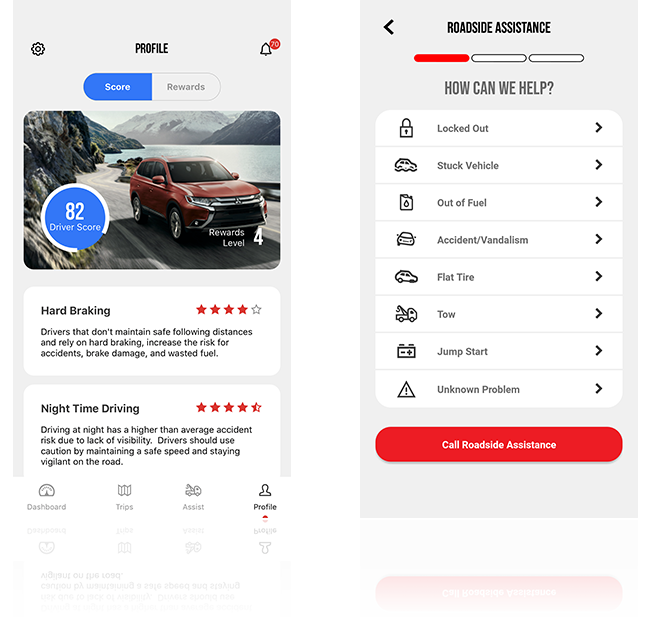 Whether you are stranded with a flat tire, empty fuel tank, lost your keys or other roadside events, Mitsubishi&apos;s Road Assist+ matches your location with the closest available service technician to help get you back on the road. Road Assist+ can even help you find a better rate on your auto insurance. Request auto insurance quote from participating carriers. Accurately measure driving quality using your smartphone sensors. Road Assist+ gives you journey feedback and a score based on how smoothly and safely you are driving. At-a-glance you can view the driving areas that potentially put you at risk, access trends and your driving score. Drive smarter and safer to your destination using the Mitsubishi Road Assist+. Easily access discounts and earn a Mitsubishi reward. Please note: Currently the app is only compatible with iPhone iOS 8.0 or later and Android 4.4 and up. Call 1-888-MITSU2015 (1-888-648-7820) for roadside assistance. We will also arrange to make or change your reservations in case of delay associated with a roadside breakdown. At your request, our representatives will notify your family members or colleagues to inform them of a delay, call a business associate to cancel a meeting or take care of any other necessary details to help ease any inconvenience. We will also locate the nearest ATM using your specific network system (Star, Plus, Cirrus, etc. ), according to the area code and prefix from your location. Generally, there is no charge for any of the services listed for five full years, without regard to mileage. However, you will be responsible for the cost of non-warrantable parts, lost-key replacement or non-warrantable tire repair. You are also responsible for the cost of any personal services we arrange for you, such as an airline ticket. But beyond five years and through the term of the 10-year/100,000 mile Powertrain Limited Warranty for the first owner, we'll still arrange for a warrantable tow at no cost to you. * Effective with 2005 models, timed from the date first sold or put into use, whichever is earlier. Coverage excludes winching of vehicles off road, vehicles disabled in rally racing or other competitive events and vehicles used for commercial purposes, such as police, taxi, route delivery, livery or daily rental services. This excludes the i-MiEV. Please see your warranty manual for details. MMNA reserves the right to limit and/or change available services.